IHH is offering a wide spectrum of Parker Quick Coupling products to fit the demands of applications across a host of markets. There are Quick Couplings for virtually any application where hoses or implements require connection without the use of tools. Swivels allow hydraulic hoses to turn without twisting and binding. Sophisticated SensoControl® Diagnostic Equipment detects even the slightest variances when troubleshooting or proving your system. Thermoplastic Quick Couplings are compatible with many chemicals used in both agricultural and industrial applications. Parker Check Valves eliminate potential damage caused by fluid back pressure. Industrial Hose & Hydraulics distributes the highest quality of petroleum tanker transfer products manufactured by Dixon/Bayco. Industrial Hose and Hydraulics is overstocked with Water Hoses, Fuel Hoses, Chemical Hoses and Dry Cement Hoses. Fittings are also available. 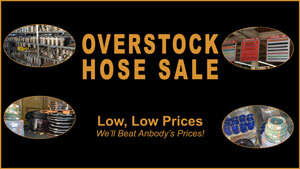 We need to get rid of pallets and pallets of hose now so we're offering low, low prices. We will beat anybody's prices, guaranteed! South Florida customers, Order by Noon and get same day delivery. Don't miss this sale! 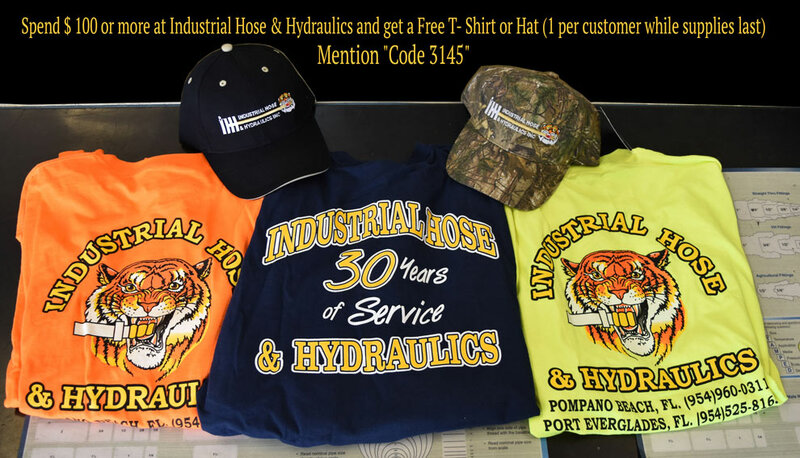 Call Industrial Hose and Hydraulics at 954-960-0311. Safety is the number one concern when loading and unloading petroleum between a fuel terminal facility and a transportation vehicle and then unloading to a dispensing source. You need products you can depend on to provide a transfer of fuel in an efficient and safe way that follows all OSHA compliance standards. Drop Adapter 4" X 22.5 Deg A 22.5 degree angle makes service station drops a breeze with easy hose coupling and fast, unrestricted off-loading. Engineered to mate with API RP 1004 Bottom Loading Adapters, each adapter comes with a heavy-duty attachment chain and uses a large, resilient gasket that guarantees minimum product loss. This lightweight adapter outlet is 4" x 4" x 22.5" Deg with sight glass, Buna. DROP-CC-64-64-64-20 Other Lengths Available Upon Request 4" Truck Drop Hose with Grounding Wire Completely Assembled Hose Includes the following Components: 19.5' x 4" Drop Hose (20' assembled length) Female x Male Shank Banding Sleeves Stainless Steel Banding Clamps (2 per end) Temperature Ranges: -30°F to 140°F Applications: Tank truck gravity drop hose for such items as gasoline, naphtha, kerosene, light and heavy oil, diesel, and up to 15% ethanol mixture. Not for Bio-diesel. Features: Static grounding wire, 50% lighter than conventional rubber hose, external helix provides for easy drag, and rated for up to 40% aromatic content. Construction: Nitrile rubber, rigid PVC helix, synthetic braiding, smooth bore, static grounding wire, corrugated O.D. Notes: Banding sleeve must be used for 3 and 4 inch sizes. Static wire must be properly embedded during fabrication and tested to assure static grounding of hose to a grounded system.